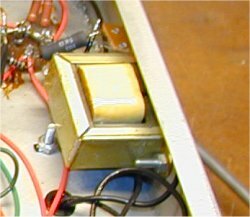 These pages describe an experimental/prototype Marshall/Plexi-style amp which I built using an old Traynor YBA-2 amp (sorry, Traynor fans!). 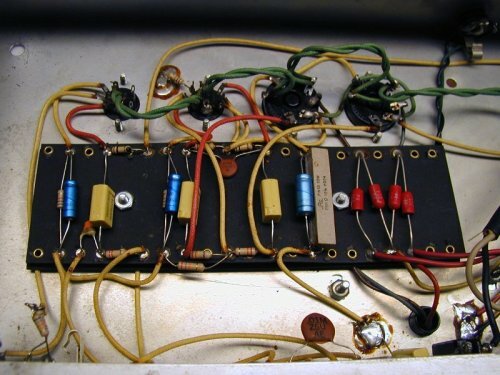 I did this partly for fun, and partly as a test bed so I could fool around with all the various component values used in the many JTM45/1987 amps that have been produced by Marshall over the years. I also wanted a lower power "November"-style cruncher (see ax84.com) for fooling around in the basement. This is an ugly duckling - I spent almost no time on aesthetics, and used the holes already in the chassis wherever they were, only drilling new holes where I had to. Bottom line: It didn't cost much and it sounds great! 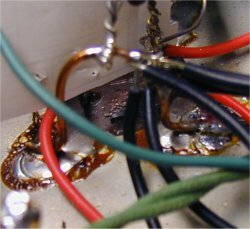 Note: YOU CAN GET KILLED by fooling around with the high voltages in a tube amp. Don't even attempt this work unless you have at least some experience and are pretty sure you know what you're doing! The Schematic is partly original Marshall (most of the preamp), partly November (the PI in particular), and partly my own design. Here's the updated schematic, which corrects a couple of errors on the original, and which uses more commonly available parts as of 2008. Here's a matching parts list. 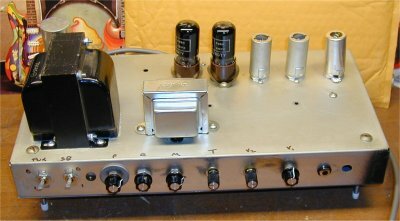 Starting with the original chassis, I stripped all the parts except the transformers, tube sockets, and the filter cap. Then I made a hole for a third 12AX7, mounted a socket, and connected the filament wires. I drilled three more holes for the pilot light, mains and standby switches, and mounted the switches, pots, and a NOS Dynaco power supply inductor. I created a ground buss out of 14 gauge copper wire bent into an Omega shape, and soldered the legs to the chassis (using a big 'ol 120 watt Weller). As shown in this picture, all grounds connect here.